Hebrew School Register - Chabad of Placer County, Where every Jew is Family! 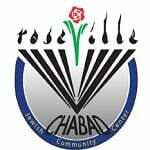 As the parent(s) or legal guardian(s), I/we authorize any adult acting on behalf of the Chabad of Roseville Hebrew School to hospitalize or secure treatment for my child. I further agree to pay for all charges for that care and/or treatment. It is understood that, if time and circumstances reasonably permit, Chabad Hebrew School will try to communicate with me prior to such treatment. I/we hereby give permission for my child to attend all field trips and outings sponsored by Chabad of Roseville Hebrew School.